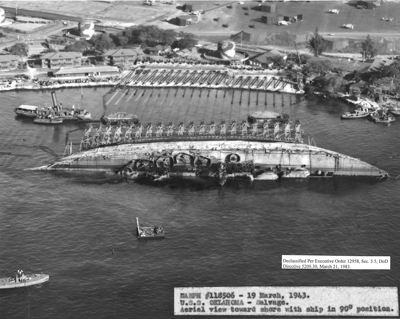 The USS Oklahoma was on Battleship Row in Pearl Harbor on December 7, 1941. That was the morning the Japanese Empire attacked the United States by surprise. 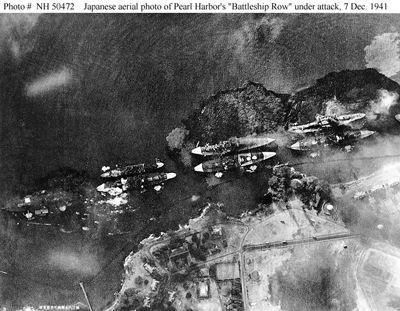 The Japanese used dive-bombers, fighter-bombers, and torpedo planes to sink nine ships, including five battleships, and severely damage twenty-one ships. There were 2,402 US deaths from the attack. Of those deaths, 1,177 were from the USS Arizona, and 429 were from the USS Oklahoma. 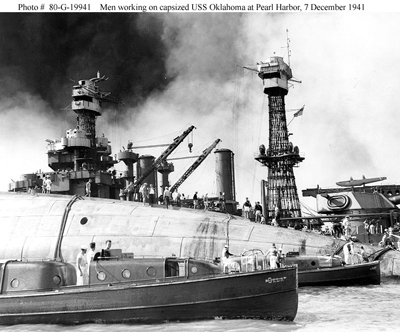 The crew of the USS Oklahoma did everything they could to fight back. In the first ten minutes of the battle eight torpedoes hit the Oklahoma and it began to sink. A ninth torpedo hit the battleship as it sank in the mud. 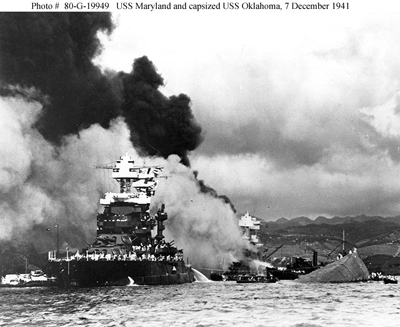 After the battle, the Navy decided that they could not salvage the Oklahoma due to the amount of damage it received. They decided to right the ship and then salvage any equipment or steel they could for other ships to use. They finally finished salvaging everything they could in 1946, and then sold the hull of the Oklahoma to a private company that tried to tug it to California. On the way to California, the hull began taking on water and finally sank to the bottom of the Pacific about 500 miles east of Hawaii. Today, there is a memorial to the USS Oklahoma and the 429 sailors and marines lost on December 7, 1941, located on Ford Island in Pearl Harbor, Hawaii. 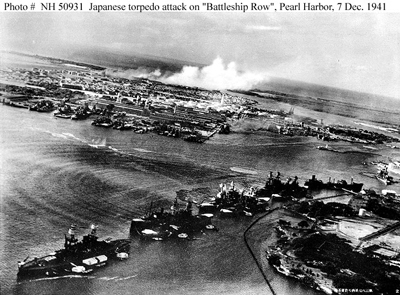 The Japanese attack at Pearl Harbor made people in the United States angry. The Japanese military had attacked without warning, and without a formal declaration of war from the Empire of Japan. The next day, President Franklin Delano Roosevelt went before Congress and asked them to declare war on the Empire of Japan. Congress passed the declaration of war with only person voting "no." Three days later, the German Empire declared war on the United States because Germany wasJapan's ally. On December 11, 1941, the United States declared war on Germany, making it the official day that the United States entered World War II. 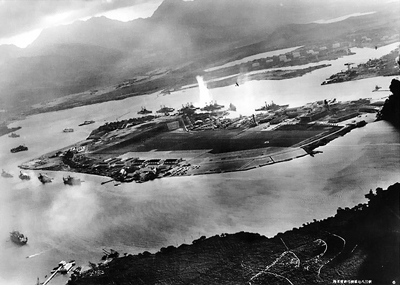 A Japanese pilot took these three photographs during the attack on Pearl Harbor. This photo shows the severity of the attack. The darker waters around the Nevada (left), West Virginia (center), and Oklahoma (right) are actually oil slicks from the fuel reserves on board each ship. The Oklahoma is already listing badly, as the edge of the port deck has already slipped underwater. It would completely capsize only a few minutes later (image NH 50472, courtesy of Naval Heritage & History Command). This shows the first wave of torpedoes hitting the West Virginia and the Oklahoma. The great plume of water in the center is the result of a torpedo striking the West Virginia. A similar plume would have accompanied the torpedo strikes on the Oklahoma (image NH 50930, courtesy ofNaval Heritage & History Command). This shows the second wave of torpedoes hitting the West Virginia and the Oklahoma. The California (far right) has already sunk, and the Arizona's (second from the left, next to the island) stern is in the water. The Nevada is still moored in the lower left of the photo (image NH 50931, courtesy of Naval Heritage & History Command). This photo was taken shortly after the start of the attack. The first wave is over, and the Oklahoma lies capsized in the harbor, while the West Virginia burns in the background (image NH 19949, courtesy of Naval Heritage & History Command). In order to right the USS Oklahoma so that it could be salvaged, the Pearl Harbor Naval Shipyard constructed cranes on the shore and attached uprights to the hull of the Oklahoma and used cables and winches to rotate the battleship until it was upright once more. This picture shows the Oklahoma as it reached the 90 degree position (image ARC #296975, Courtesy of the Library of Congress). This photo was taken shortly after the attack. The Oklahoma lies capsized in the harbor, while sailors begin rescuing crewmen that are in the harbor or trapped on the capsized Oklahoma. The small boat in the foreground is the Captain's Gig from the Oklahoma, which had launched from the Oklahoma before the attack began (image NH 19941, courtesy of Naval Heritage & History Command). 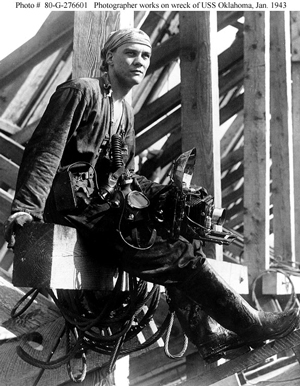 Photographer's Mate 3rd Class T. E. Collins takes a break after photographing the salvage efforts on board the USS Oklahoma. Documenting the ship's salvage was as important as the actual salvage operation (image 80-G-276601, courtesy of Naval Heritage & History Command). It's March of 1943, and the guns of the Oklahoma are exposed to sunlight for the first time in fifteen months. 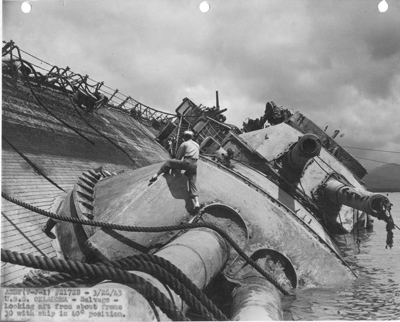 A salvage worker is scrambling over the Oklahoma's turrets to check the cables needed to pull the last little bit before it is properly righted (image courtesy of the Pearl Harbor Naval Shipyard). 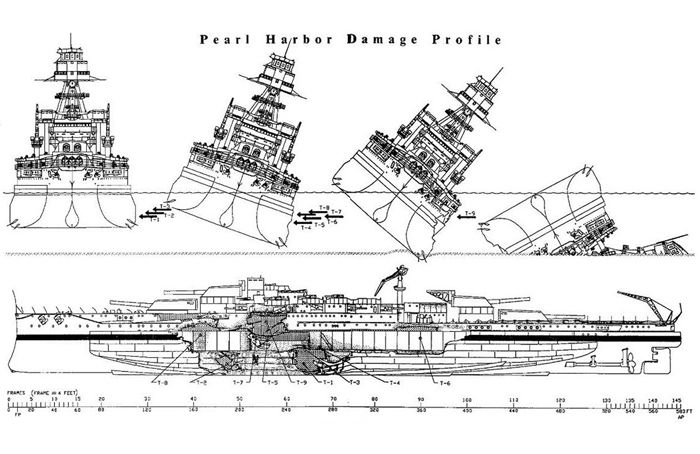 This drawing shows the damage to the USS Oklahoma caused by the Japanese torpedoes. It also shows the Oklahoma capsizing, and how it came to rest in the muddy bottom of Pearl Harbor. Each black arrow represents a torpedo hitting the ship (illustration courtesy of WFI Research Group).